If you operate a website, are you aware of the ways in which website operators can become liable for use of external links? Traditionally, website operators have not been held liable for merely placing an external text link on their website. But, doing more than simply placing a text link on your site and your website content may in many instances result in liability. The following legal guide will introduce you to basic liability resulting from misuse of external links and for framing. Before I discuss external links and framing liability, you should understand the basic types of website links if you don't already. There are two basic types of external links. Text links (embedded links in text) are called hypertext reference (“HyperREFerence”) links. These links can lead to a different point on the same page, or to a different page in the same site. Of course, hypertext links can link to third party webpages also. A graphic may serve as a hypertext link, but usually these links commonly appear as underlined, capitalized or otherwise prominent text. The second type of link is an Image (“IMaGe”) link. An IMG link directs the web browser to retrieve an image from a separate image file. This type of link can reference a file from within a website, or from a third party web site. For example, using an IMG link, a web page could direct the visiting browser to retrieve a protected image, video or other content contained on another website and show it on the original website. This presents a seamless integration of web content even though they are not from different websites. This process, linking and incorporating the content (text, video, audio file, etc.) of another website is also known as “in-line liking.” For instance, a video link embedded on your website is simply an in-line link. An in-line link displays, or “frames” the third party file on the original web page. When the user visits the original page, the HTML code on the original page direct the user's browser to the file located on the third party webpage. 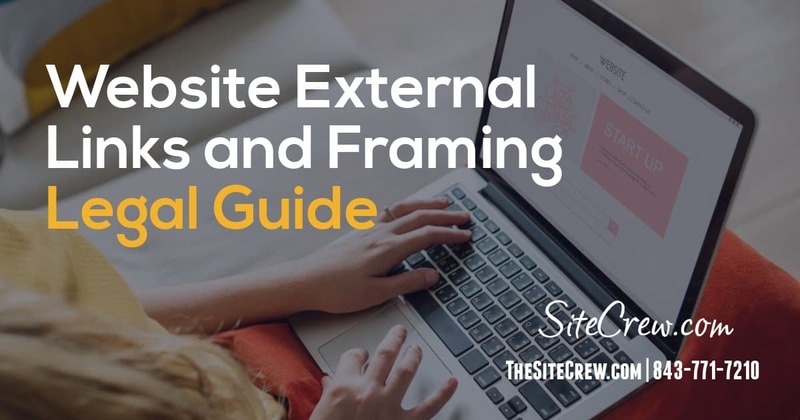 “Framing” is a practice where one website uses frames to incorporate the content of another websites into a browser window along with the content from the original website. The website doing the framing may post navigation tools, text, trademarks and/or advertising along with the framed webpages. The more the framed website is integrated into the original website users may become confused over affiliation, endorsement or sponsorship. Unauthorized framing has been challenged under a variety of legal theories, including copyright and trademark infringement, unfair or deceptive trade practices, passing off, false light and false advertising among others. Meta tags and keywords are considered “de facto” links as well. (Use of meta tags and keywords can lead to claims of trademark infringement). Most external links are lawful. Generally, permission is not needed for a regular hypertext link to the home page of another website. There is substantial case authority that provides that traditional hyperlinking is not direct copyright infringement because there is no copying or display involved. However, using external links on your website may create legal liability in some cases. External links can be unlawful when they i) cause consumer confusion; ii) encourage or facilitate illegal copyright infringement by others; or iii) violate other laws. In particular, copyright infringement (direct, contributory and vicarious infringement), trademark infringement and dilution, passing off and misappropriation are the main areas of liability. Defamation may also come into play. Contributory copyright infringement can occur by providing links to websites that display infringing material and actively encourage or facilitate the use of those links in various ways. Instructions on following links and encouraging visitors to use them or including software that facilitates downloading infringing copies of content (such as peer-to-peer software) or including software that assists the downloading of material from remote sources, are all considered material contribution to copyright infringement. In the cases that have decided this issue, the common elements have been that a middle party makes available a list of links to third parties who willingly make copyrighted works available for viewing or downloading. Websites don't directly host or re-transmit the protected content, but they do provide links to materials made available by others. Contributory infringement occurs when an individual or business knowingly induces, causes, or materially contributes to the infringing conduct of others. The essential elements of this claim are knowledge of and participation in the infringement. In establishing a claim of contributory infringement, a copyright owner must establish the website had requisite knowledge and participation. The knowledge aspect can be established if the website has been put on notice, such as by receiving a cease and desist letter from the copyright holder, or even by allegations made in a pending lawsuit against the website. The participation aspect can be established by placing a link which facilitates the user going to another website containing the infringing items. -EXAMPLE: Intellectual Reserve, Inc. v. Utah Lighthouse Ministry, Inc. (1999): A website (Intellectual Reserve) posted copies of a church's copyrighted handbook and provided links to other sites that contained infringing copies of the handbook. In this example, the defendant knew and encouraged the use of the links to obtain the unauthorized copies. This was held by the court to constitute contributory copyright infringement. The court issued a preliminary injunction directing the defendants to remove statements identifying the domain names of websites containing the handbook. This was held by the court to constitute contributory copyright infringement. The court reached this result despite the fact that the defendants' website did not contain any direct links to the infringing websites. Case law has shown that defendants have been found liable because they did more than just post links. The intentional encouragement of copying or downloading of protected materials is a liability trigger. Context can make it clear that a link is posted merely for its informational (indexing, referencing) content. Without active encouragement of use of illegal content, then “aggravating” factors are missing and courts have not imposed liability. In cases involving informational (“pure speech”) links, the elements of material furtherance of infringement (contributory infringement) and financial gain from infringement (vicarious liability) likely don't exist. But, contributory infringement is subject to reasonable limits. -EXAMPLE: Bernstein v. J.C. Penney, Inc.: A photographer sued the retailer J. C. Penny for a link on its site to a movie database. This link in turn linked to a site in Sweden that allegedly infringed the photographer's copyright in a couple of photographs.The court denied the plaintiff's motion for a preliminary injunction, and the plaintiff dismissed his case. Although a final resolution was not reached, this case suggests that claims of contributory infringement cannot be remote. There must be some reasonable limits in terms of third party linking to infringing materials. Deep links direct the user to an image or webpage other than the homepage of a third party website. Many websites post introductory materials including third-party paid banner advertisements and special promotions or teasers relating to their own site on the home page. Businesses expect that most website visitors will find those advertisements before going further into the website's other pages. Deep linking and bypassing the home page of some other website has caused lost revenues. Of course, this has led to lawsuits. But, deep linking to interior pages of a website by itself is not copyright infringement when the copyrighted materials are not shown or displayed on the original website. Deep linking by itself without confusion of source is not unfair competition. (Ticketmaster Corp. v. Tickets.com, Inc.). If deep linking is somehow done in a way that would confuse viewers as to affiliation, sponsorship or endorsement by the other website (i.e. trademark infringement), this could trigger a claim. For example, a deep link that says “Click Here For More Information,” which then leads viewers to a page on a competitor's website containing information about a similar product. Can I embed links to videos and use “In-line” Image links? Case law has held that In-line linking and framing by itself is not direct copyright infringement. The content is not a display or distribution in violation of copyright law. In-line linking and framing may cause some users to believe they are viewing a single webpage (seamless content). But, the Copyright laws do not protect a copyright holder against acts that cause consumer confusion. Without causing consumer confusion, in-line linking and framing is within the law (although it's considered bad web etiquette). In order to prove direct copyright infringement, a plaintiff must first prove that the defendant copied the protected work. A plaintiff must first establish: (1) ownership of the allegedly infringed material and (2) violation by the alleged infringer of at least one of the exclusive rights granted to copyright holders. Many of the claims for direct copyright infringement for “unauthorized” use of in-line linking and framing have gone nowhere. This is because there was no actual copying and display of the infringing content. -EXAMPLE: Perfect 10, Inc. v. Amazon.com, Inc., et al. (2007): In what was the first court to provide an actual decision regarding the use of framing, the Ninth Circuit Appellate Court held that framing infringing images found on third party websites via in-line linking is not direct copyright infringement. Google presents a framed page in its search results where the bottom half comes directly from the third party web site where the image is actually found. The court used the “server” test and decided that a website that “frames” content by providing an in-line link to the copyright holder's site is not a public display or public distribution. The framed content is not being stored on the framer's server. The court also found that Google did not commit direct copyright infringement by providing “in-line links” to third party websites that contained infringing images. The Court stated that providing a link to a third party website that displays infringing images, by itself, does not make the original website liable for copyright infringement. The Court also laid out a new test for secondary liability on the Internet. A computer system operator must have “actual knowledge that specific infringing material is available using its system” and “continue to provide access to infringing works.” This is true despite the fact the provider could take simple measures to prevent further damage to the copyright holder. The court struck down the vicarious liability infringement claim due to Google's use of in-line links because Google had no ability to control the third party websites or compel them to remove infringing images found on those sites. Framing and Inline linking of third-party content into another web page can potentially raise the following issues: trademark infringement, passing off, defamation and possibly copyright infringement for creating a derivative work. Framing and in-line links pose the same trademark and derivative work concerns. Framing might be viewed as more problematic when it comes to trademark infringement. A viewer could easily conclude that all the material on the framing website belongs to that site. But, you cannot in-line link or frame third party web-content and always escape liability. Even though you are not directly copying the content, your framed page along with the content from an external framed page could be viewed as an unauthorized modification of the content. In terms of potentially creating a derivative work, this really is a grey area and depends on the context and nature of the framing. So far, the issue hasn't been directly decided, but many intellectual property attorneys feel this practice could result in a derivative work. -EXAMPLE: In Futuredontics Inc. v. Applied Anagramic Inc. (1997): Applied Anagramic (Defendant) operated a web site and divided its pages into frames. Defendant's website contained an unauthorized link to the Futuredontics website that caused copyrighted materials on plaintiff's site to appear within one of the frames of Defendant's website. The problem was that the rest of the page was filled with content supplied by Defendant, including its logo and information about its business operations. The court found that Futuredontics had failed to show that it was or would be injured by defendant's conduct. Absent the requisite showing of injury, plaintiff was not entitled to injunctive relief. However, the court left the door open for the creation of a derivative work. The district court would not dismiss the claim holding that the defendants conduct may create an unauthorized derivative work. Any link (in-lining or framing) that falsely leads the viewer to conclude that the web page (owner) is affiliated, endorsed or sponsored by the trademark owner could lead to a claim of trademark infringement. Trademark infringement basically occurs when someone uses a mark of another in such a way that creates a likelihood of confusion. Using an image link or framing that places another party's trademark or logo on your web page may cause confusion.For example, the use of a company logo to link to the company's website could be trademark infringement. If the consumer is likely to believe that the third party business or website is associated with your website, it is infringement. As a general rule, a link that simply uses a text reference rather than a logo or trademark does not make any implication about affiliation. The use of logos and trademarks as direct links presents an obvious problem. Using a trademark or logo can expose you to liability if a court finds that the reasonable consumer would likely be confused, given the facts. In addition, The Federal Trademark Dilution Revision Act (FTDRA) of 2006 provides owners of famous marks with protection against dilution by blurring and dilution due to tarnishment. Under the revised FTDA, the plaintiff only needs to show the defendant's mark is likely to cause dilution. Improperly framing content of another website may result in consumer confusion (direct infringement) and/or claims of dilution. -EXAMPLE: Washington Post Co. et al vs. Total News, Inc. (1997): The website Total News was sued by the Washington Post and CNN. The plaintiffs claimed trademark dilution for the framing of the news pages of plaintiffs' sites in a frameset that contained TotalNews advertising. Plaintiffs believed viewers of Total News would be confused since the viewer would see the plaintiff's news pages within a Total News frame, but without plaintiff's banner advertisements. This case was settled without a decision, but Total News agreed to stop framing and to use text-only links. -EXAMPLE: Hard Rock Cafe, Int'l, Inc. v. Morton (1999): Defendant installed a link on their website which contained the words “record store.” Clicking on this link took the user to the “Tunes” web page which appeared in frames on the defendant's website. Frames appeared above and to the left of the webpage content containing the Hard Rock Hotel logo. The court found that a likelihood of confusion arose from framing the website because the distinction between the two sources of material appearing on the screen was not clear. “Through framing, the Hard Rock Hotel Mark and the [infringing site] were combined together into a single visual presentation.” However, the court did state that framing is a flexible device that in some instances might provide a clear distinction between different sources of the content. A direct link contained on an offensive or disparaging website (i.e. a pornographic site) could potentially trigger a claim for trademark tarnishment? Rule: If no “reasonably prudent Internet user” would associate a trademark with the linked site, then this claim would likely fail. -EXAMPLE: Ford Motor Company v. 2600 Enterprises (2001): Defendant's website contained a text link to Ford's homepage from the website fuckgeneralmotors.com. Ford sued for trademark dilution, trademark infringement, and unfair competition. The district court stated that linking by using a trademarked domain name in a programming code is not a violation of the Ford trademark nor is it dilution of the mark. -EXAMPLE: Voice-Tel Enters., Inc. v. Joba Inc. (2003): A claim for tarnishment cannot arise from the use of a trade mark on a website containing a link to a potentially offensive site. Using external links improperly may be “passing off” if a website uses links to suggest that its products are those of a more highly regarded competitor. There are additional common law claims under state unfair competition laws, namely passing off, contributory passing off, reverse passing off, and misappropriation. Passing off occurs when someone or some business tries to pass off its product or services as a third party product or services (or as having some association or connection with a third party when this is untrue). So, for example, framing webpages of a competitor's website in a way that suggests your products are affiliated or made by the competitor. 1. Contributory passing off occurs when the defendant assists or induces another (typically a retailer) to pass of its product as the plaintiff's product. 2. Reverse passing off occurs when someone tries to pass off someone else's product as their own. If you pass off images or logos via in-line links or by framing within your website in a way that suggests affiliation, this could amount to reverse passing-off. This is basically where the work of someone else is passed off as your own. For instance, you could tell your viewers to “click here“ to see some product examples of what you sell, but which are taken from a competitor's webpage, and then claim they are your products. This type of reverse passing off by using a link to pass-off another's work violates state unfair competition and/or unfair business practices laws. is unauthorized use of another party's property of funds for personal gain. This is yet another potential concern if your using an external link(s) in a manner that allows you to gain something of value. Linking to a source which turns out to contain misleading or which contains harmful information may cause liability for negligence. Even simple informational links posted with no particular commercial purpose could create risks under the theory of “negligent publication.” Carefully drafted disclaimers in an External Links Policy, as discussed below, can help advise your website viewers that you are not responsible for third party website content. A link to another's webpage or image could be defamatory. For example, “This mortgage broker ripped me off and lied to me.” The statement itself does not identify the party. The link (assuming it actually linked to someone's website or webpage) provides the context that turns the statement into defamation, however. TIP #1: Use External Links Policy/Disclaimers! Using a properly drafter External Links Policy, which is really just a set of disclaimers, can serve as a defense to liability for external links. The disclaimers can help protect your business against a claim that could be made by any users of your site. Posting disclaimers is not an absolute shield from liability. But, it does put users on notice that the business does not control or have any affiliation with the content of third party websites. It can also set forth a policy for placing links on your website. Properly drafted external links disclaimers can prevent claims by your website users. Some websites post no specific disclaimers, but instead display a notice stating something like “by clicking on this link, you will be leaving this web site and will be directed to a third party site, which we have no control over the content.” This operates as a disclaimer. You could also choose to use a link prominently located on your website leading to a separate page with the policy. Using a link labeled “External Links Policy” is customarily how this should be handled. But, any link should be prominently located on your website and not hidden. TIP #2: Post a Hyperlink Policy On Your Site! Your website should contain internal policies concerning who may link to your website and the manner in which it must be done (i.e. a “Hyperlink Policy”). You should also use a link exchange or hyperlink agreement whenever another website wants to do a link exchange with your site. This type of agreement should be used regardless of whether your business is being compensated for placing the link. The most important item to address in such an agreement is indemnification. I talk more about Indemnification later, but it basically is a way to get compensated by the owner of another website for liability your business incurs. If there is infringing material on the site, the linked-owner is required to indemnify (reimburse all financial damages and costs incurred due to the link on your site) and defend your business against any claims. Indemnification should cover any claims of libel, violation of right of privacy, plagiarism, copyright or trademark infringement and any other claims or suits based on the content contained on the third party website. Any website requesting a link should also provide a warranty and representation that the website operator(s) has the right to display all materials contained on the website. None of the content on the third party site should infringe on the rights of others including but not limited to rights in trademarks, copyrights, and patents. Further, the operators should warrant and represent that the third party website does not contain any obscene, vulgar, defamatory or any other illegal material. Obtain Permission to link to another website.The simplest and most direct way to prevent claims for infringement is to obtain permission. Some websites solicit or encourage links, and even make symbols and other graphics available that you can download and use as the linking symbol. Some web sites perform some type of limited screening and approval process before granting permission. Otherwise, you can contact the website administrator directly via email and request linking to the website or a link exchange ideally. This article was written by Philip A. Nicolosi, J.D. Mr. Nicolosi provides legal services through his law firm, Phil Nicolosi Law, P.C., focusing on startup and small business law, Internet & technology law and commercial transactions. Mr. Nicolosi serves as a trusted advisor to numerous startups and small to medium sized businesses. This includes representation for a wide range of business law matters including business organization, corporate/LLC governance, regulatory law, contracts and transactions and most other matters outside of litigation. Mr. Nicolosi provides guidance with e-commerce, Internet marketing and technology-related legal matters. He also assists startup technology companies with seed financing, venture capital and exit transactions. Mr. Nicolosi is also the founder of InternetLegalArmor (www.internetlegalarmor.com), an automated custom website legal document solution. https://thesitecrew.com/wp-content/uploads/2018/10/Website-External-Links-and-Framing.jpg 630 1200 admin /wp-content/uploads/2015/09/logo-large-e1443277888385.png admin2018-10-21 18:34:562018-10-21 18:35:32Website External Links and Framing Legal Guide!